The Rotary Club meeting for March 12 started off with recognition of Rotarians that helped make the Baja Beach Bash a success. $2,850 in sponsorships were raised for the event with Lawley Automotive as the largest. President Nancy Fusco was the lucky winner of the 50/50 raffle at the Baja Beach Bash. Karina Rice-Roberts is working on the picnic with the Agua Prieta Rotary Club in Sonora, Mexico. The event will be held on Saturday, April 14. BBQ and Thank You for Bus Stop Support. President Nancy Fusco passed around the Rotary Foundation annual report and noted that one in three people in the world lack access to proper toilets and one in ten people in the world lack access to clean water. More statistics of this nature can be found in the annual report. Rotary leadership assemblies will be held on May 5 in Green Valley. Grant management webinars will be held on May 30 and June 30. We need two people to attend. The annual 4th of July Celebration will be held July 3 and 4. March 21 will be the first committee meeting at 9 AM, held at Fire Station 3. If you want to be on the committee reach out to Randy Sueskind. Most of last year’s committee members are returning. In celebration of upcoming St. Patrick’s Day our own leprechaun, Jerry Regan provided Jameson Irish whiskey for those who desired to enjoy and presented a sweet toast. He then proceeded to introduce The Rooks, who performed authentic Irish Music and Songs. The Rooks hail from Bisbee and include band members Jamie Wahl, James Mahoney, Ca-do Daily, Darrell Thompson and Becky Reyes. 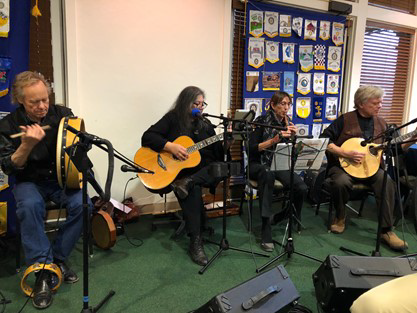 They opened with ‘Irish eyes are smiling’ and performed more than six songs for all to enjoy. More information on The Rooks can be found at bisbeerooks.com.